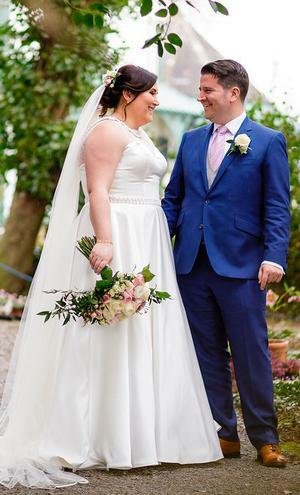 "Wed wanted somewhere private and the feeling we were having a huge house party with all our closest friends and family - it was our home away from home"
Eimear Hernon from Offaly and Mark Tierney from Dublin first met on a night out in Dublin. Following a couple of 'unsuccessful arrangements' to see each other after that night, they eventually went on a date in House on Leeson St and as the cocktails and chats flowed, they both realised they had a lot in common. Fast-forward to their annual New Year's trip to Galway and Eimear was slightly perturbed to find Mark suddenly very enthusiastic about going for a walk to the beach at Spiddal. See Eimear had only had her hair done, and the weather was less than ideal to maintain it. 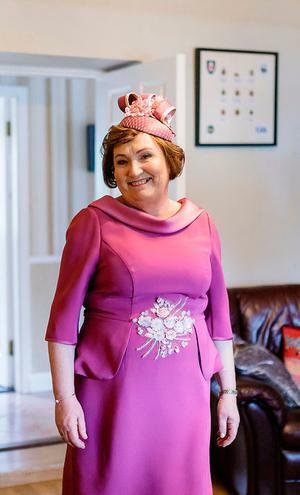 "We left Birr and I moaned the whole way to Galway about the walk so eventually we compromised and decided to go for a walk on the prom in Salthill," she recalls, "we walked out onto one of the piers and Mark dropped onto one knee. It was very romantic - but the hair wasn’t the better for it!" 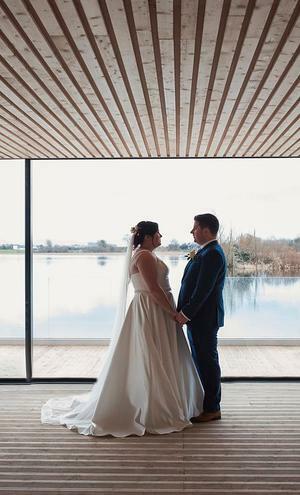 The couple set about planning a 'fun and inclusive' wedding, and both agreed that they would concentrate on creating a day for their family and friends to really enjoy, which meant 'good food, good drink and great music'. 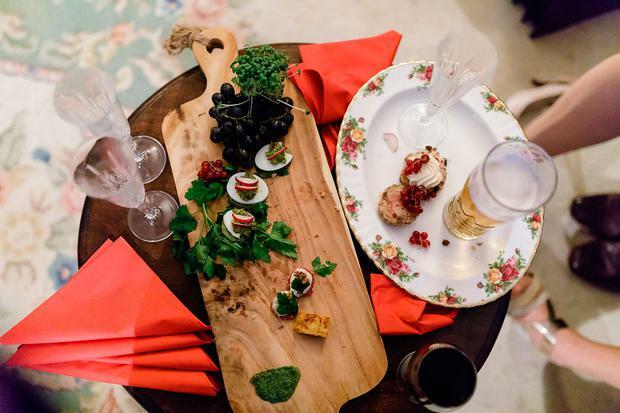 They chose Ashley Park House in Nenagh, Tipparary, for their reception, feeling that as they were able to hire the venue for themselves for the weekend, it would be perfect for the 'house party' style wedding they craved. The couple exchanged vows in St. Brendan’s Church, Birr in a ceremony officiated by Fr. David Carroll. 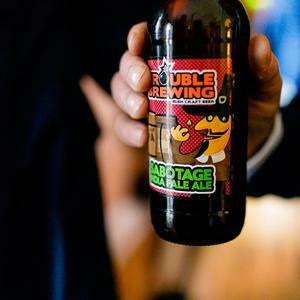 Their photos are by Katie Kavanagh of Katie Kav Photography. 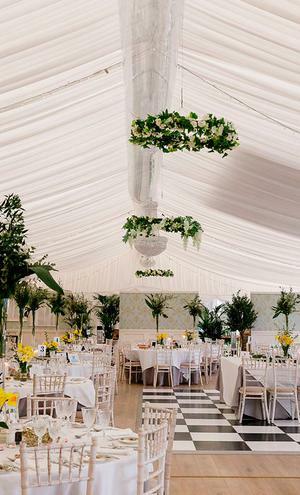 Following a slight Pinterest obsession and lots of net surfing, Eimear was quickly drawn to a floral theme with spring pastel colour palette and pearls. She carried the floral theme throughout the decor, from the invitations to the table plans, the menus, mass booklets, and of course the ceremony pew ends and bouquets. 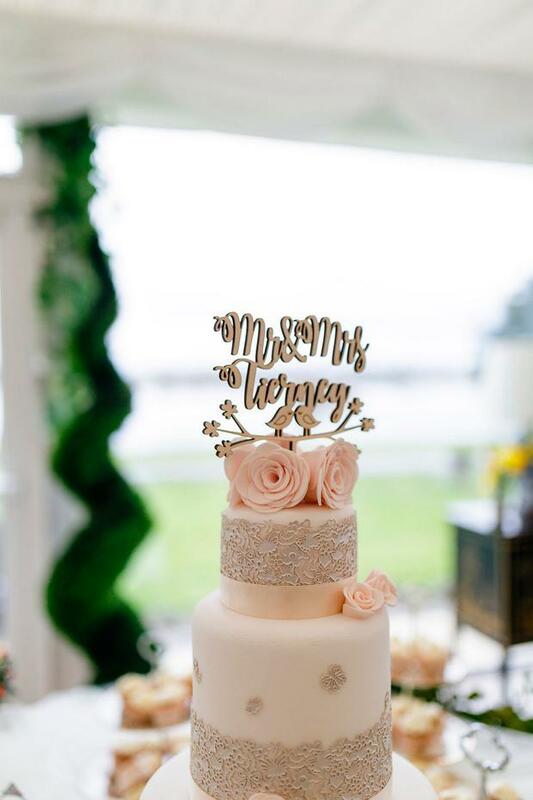 "I wanted to plan a wedding that was thematic and links could be seen throughout," says Eimear. 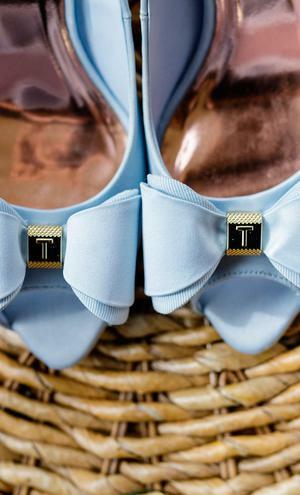 "There was pearls on my dress which I included on the invitation envelopes to my earrings." 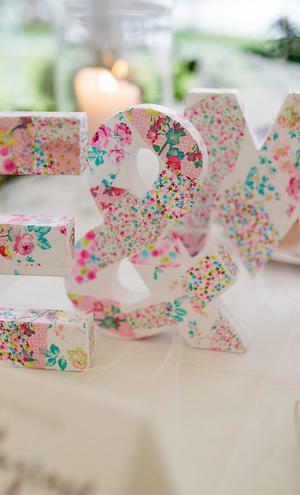 Eimear "absolutely loved" planning the wedding, explaining that they took their time and planned it in stages. "The first two months we booked the main priorities... the venue, church, band, photographer, the videographer.... A lot of services were obvious choices because they were local businesses that we knew and trusted." "Friends and families overwhelmed us how much interest and enthusiasm they showed throughout the planning," says Eimear, "they were all so helpful and it just made the whole process so enjoyable. I’m not a procrastinator, when I make a decision and like something I’m done and Mark is similar. Therefore we were pretty good at decision making and being confident in our decisions. You need to trust the professionals because they do this every weekend and they’re reputations are built on doing a good job!" 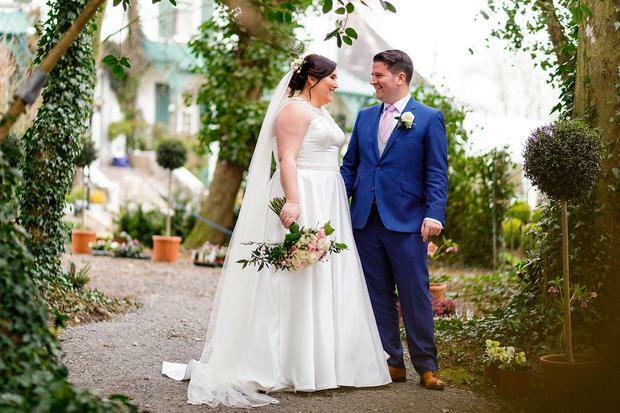 The couple chose Ashley Park House in Nenagh for their reception, citing the privacy, 'sense of it being ours', and the décor and character as the main reasons behind their choice. "We wanted somewhere private and the feeling we were having a huge house party with all our closest friends and family," says Eimear. 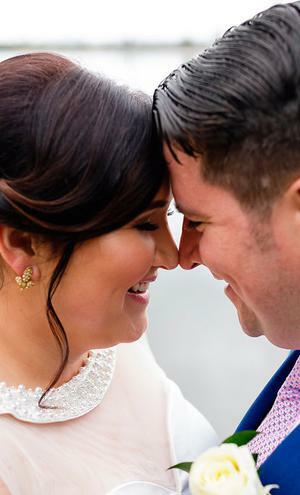 "I remember when my cousin got married she said she viewed a hotel and half the town was sitting in the foyer… this always stuck with me so when we found Ashley Park I knew immediately we hit the jackpot. We both loved it because it was like our home for the day." 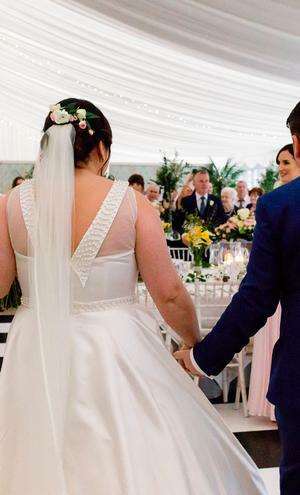 Eimear found her wedding dress in Ruben Bridal in Calverstown and said as soon as she tried it on she knew it was 'the one'. "My mam, aunt and I did two days shopping and they were fantastic," she adds. 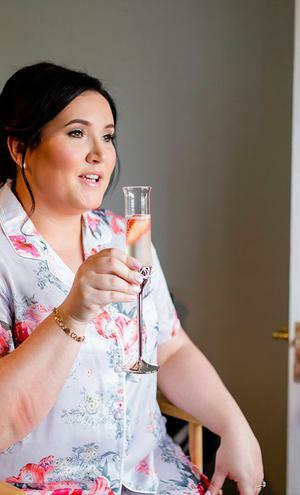 In the run up to the big day Eimear wanted to celebrate little milestones along the way; "Each day was a celebration and excuse for a glass of bubbles and a nice lunch!" she says. "We loved dress shopping, it was so much fun and surprising how much choice there was and how many dresses actually suited me. Having found the dress, two of my cousins/bridesmaids came for a viewing and we celebrated again with some more bubbles!" Eimear's adult bridesmaids wore dresses by V by Very, and her junior bridesmaid wore a dress from Monsoon. Eimear made the pew ends for the church, buying what she needed from DIY shop The Range in Dublin. "I also made the crates (from IKEA) for outside the church simply with flowers from The Range and selection of lanterns I picked up." 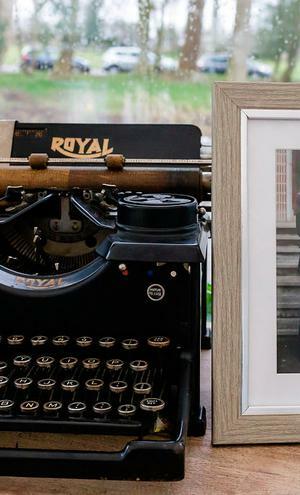 The couple had a memory board to display photos of family members they had lost. "The Vintage Chalk Room made up the board and I wrote up the poem. We made our own mass booklets also, carefully folded by my mam... patience were needed!" Fond of his fashion, Mark wanted to wear something a little different to his 'everyday' suits, and decided to go for a bespoke suit from Louis Copeland. His groomsmen wore suits from Aston Formal. 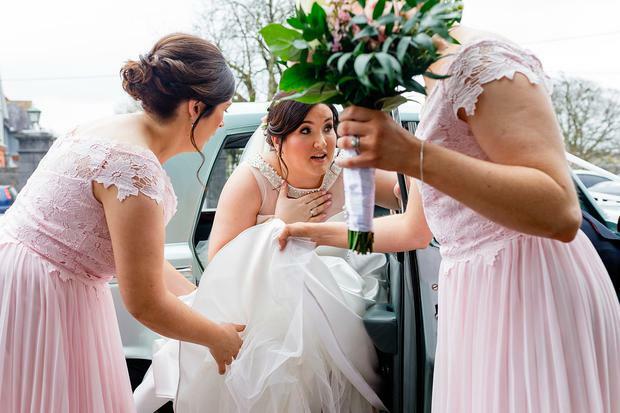 Choosing a stand-out moment from the day, Eimear says, isn't easy, however she recalls the morning of the wedding as a particularly nice time. "It was so lovely and relaxed and so much fun," she says, "the girls doing the hair and make up were great and professional (She notes to readers to keep this in mind when they're choosing their beauty team!) and the photographer and videographer put everyone at ease." Another part of the day they both loved was the journey from church to reception in their vintage car; "It was the first time alone since becoming husband and wife and probably the only time we really had alone that day (apart from the driver!). Finally the couple agree that seeing their friends and family all together in one room enjoying themselves was a particularly special aspect of the day. 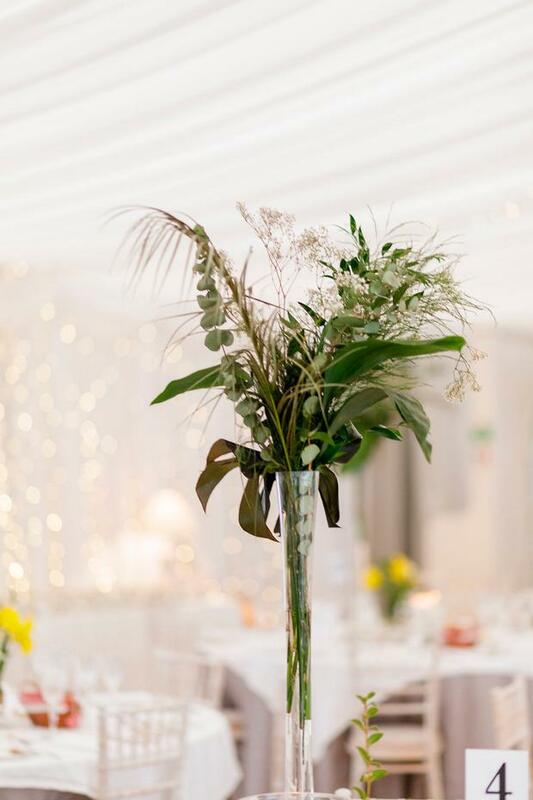 "Remember that the guests will not realise if something isn’t right or something goes wrong" says Eimear before urging couples to remember to enjoy both the planning and the day itself - "every article you read preempts the stress factor, but it doesn’t have to be this way!"